When her father became terminally ill with cancer, Lisa Smartt began transcribing his conversations and noticed that his personality underwent inexplicable changes. Once a skeptical man with a secular worldview, he developed a deeply spiritual outlook in his final days — a change that was reflected in his language. Baffled, intrigued, and compelled by her linguistics training, Smartt grabbed pencil and paper and tracked his final words. The inquiry that began with her father’s near-death language went on to become the Final Words Project, in which she collected hundreds of people’s final words and analyzed their linguistic patterns and themes. 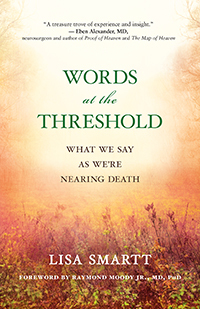 In her new book, Words at the Threshold: What We Say as We’re Nearing Death, Smartt decodes the symbolism of those last words, showing how the language of the dying points the way to a transcendent world beyond our own. We hope you’ll enjoy this short article that is based on the book. One day you may sit beside someone who is dying. And you may be surprised by what you hear. Final requests are also common in the language of the dying, but they may not always be as clear as the words above. Another woman, Sharon, told me, “My mother started talking about the five boxes, and how they were scattered across the United States and she wanted them all together. I then realized the boxes were symbolic of the five of us. She wanted to see all her children before she died.” Final wishes are sometimes clearly stated, but more often they are veiled in symbols. You may also hear puzzling and paradoxical statements like “Yes, I would like some scrambled eggs, but where would you reappear?” or “Introductory offer: store is closing.” The language of the dying often seems “nonsensical,” but clear linguistic patterns and themes emerge when we look closely. Last words are often repetitive (for example, “Oh, more . . . more . . . more worlds and worlds . . . and worlds”) or paradoxical (“Grant me a half measure of fullness”), and they often include unusual prepositions (such as “I am crossing up”). There are also many references to landscapes and visitors that are unseen by the living. • Have eyes for the sacred. If possible, think of the territory you have entered as sacred ground, despite the terrible loss looming before you. Be open to the possibility that something transpersonal is occurring and that the words you hear are tracking its course. • Assume your loved one can hear you even when they’re unresponsive or quiet. As we die, hearing is the last sense to go. Speak words that will bring joy or comfort to the person, even when you are talking in another room. • Savor silence. Sometimes it is better to just sit with your loved one. When words don’t build bridges, know that the dying may be more attuned to telepathic or other nonverbal communication, much like the kind of communication we experience when we pray. Speak to the person you love as you would in prayer. All of us are tourists and guides as we travel with those we love to the portal. By honoring the unique language of the threshold, you can open doors not only between yourself and the person you love but perhaps even to a transcendent world beyond our own. Lisa Smartt, MA, a linguist, educator, and poet, is the author of Words at the Threshold. She founded the Final Words Project, an ongoing study devoted to collecting and interpreting the mysterious language at the end of lives. She lives in Athens, Georgia. Visit her online at FinalWordsProject.org. Based on the book Words at the Threshold. Copyright © 2017 by Lisa Smartt.